The myth of Shangri-La was born in 1921 with the novel by James Hilton "Lost Horizon". In his book, Hilton describes a paradisiacal place in the foothills of the Himalayas isolated from the outside world where people lived a harmonious and happy life. Several places in India, Pakistan, Tibet and China claim to have inspired James Hilton. Shangri-La has become a symbol for Oriental exoticism and luxury. 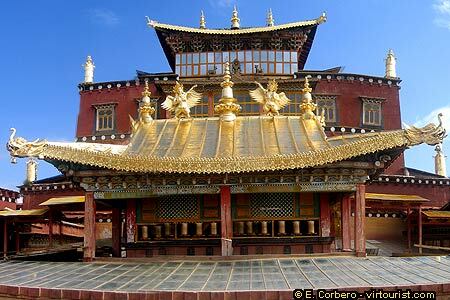 The Chinese Shangri-La is located in the northwest of Yunnan province (south of China). The two main reasons for visiting Shangri-La town are its old city and the Ganden Sumtseling Monastery. Many tourists come to Shangri-La to start an overland trip to Lhasa, in Tibet. On the following pages I will give you some information on the town of Shangri-La, its monastery and other destinations in Tibetan Yunnan and Sichuan.